In 1885, Bly wrote a furious letter to a Pittsburgh newspaper denouncing a column titled "What Girls Are Good For" that described the working woman as a "monstrosity" and said that women were best suited for domestic chores. Impressed by Bly's letter, Pittsburgh Dispatch editor George Madden hired her as a full-time reporter under the pen name Nellie Bly. She was a trailblazing journalist, an unwavering champion for women and the working poor, and a brilliant muckraker. One of her most famous assignments was for the the New York World where she posed as a mentally ill woman and exposed the horrors of a women's asylum on Blackwell's Island. 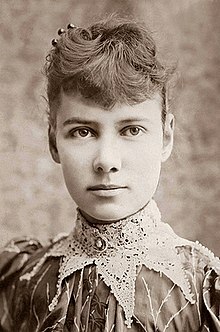 Bly also achieved worldwide fame with her 1889 trip around the world, which was inspired by Jules Verne's novel "Around the World in Eighty Days." She completed her journey in seventy-two days.